Paradise, MA, police chief Jesse Stone, reeling from the murder of his fiancée, learns that a gala 75th birthday party will be held for folk singer Terry Jester. 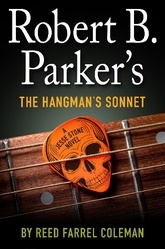 Once considered the equal of Bob Dylan, Jester has spent 40 years in seclusion since the master tape of his magnum opus, The Hangman's Sonnet, disappeared. That morning, an elderly woman dies while her house is ransacked. What are the thieves looking for? And what's the connection to Terry Jester and the missing tape? Hampered by hostile politicians, a growing trail of blood, and the town fathers' pressure to avoid a PR nightmare, Jesse solicits the help of mobster Vinnie Morris-and a certain Boston PI named Spenser-to connect the cases before the bodies pile up further.